This cherished second home is situated just a very short drive from the centre of Carvoeiro but offers an idyllic rural feel in Quinta do Salicos and is a very short drive from some of the most beautiful beaches in the area. The interior is bright and tastefully furnished to a very high standard, and as the owners spend all of the winter there you will find it very well equipped indeed. The triple aspect open plan kitchen, dining and living area is spacious and flooded with light, opening directly to a covered terrace, a perfect outdoor dining spot overlooking the pool. 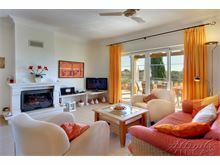 All 3 en suite bedrooms (2 upstairs and 1 downstairs) open directly on to a balcony or terrace overlooking the pool, which is reached via steps from the large rear terrace and all is set in pretty well tended gardens surrounded by Oleander trees. 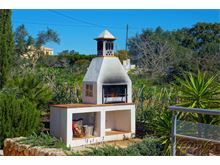 The brick built barbecue on the side of the villa is close to the kitchen and dining areas which is great for home cooked poolside dining. 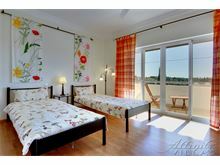 1km from a restaurant and bar, 4kms to the beach and shops. From the entrance hall there is a guest cloakroom, the Master bedroom, which has a double bed base with twin mattresses, French windows which open onto terrace overlooking the swimming pool, and an en suite bathroom with a separate shower. Also just off the hallway, is a useful utility room with a washing machine, tumble dryer, ironing board etc. and a door leads off to the garden. Head into the open plan kitchen, dining & living room with comfortable sofa seating, flat screen television, DVD player, CD player, French windows open onto a terrace which overlooks the garden and pool, the kitchen area is fully equipped with large Fridge/Freezer, dishwasher, coffee machine, Electric hob and oven. Upstairs to the further 2 bedrooms, one with double base and twin mattresses with French windows opening onto a south facing terrace overlooking garden and pool, plus a Juliette balcony to the front of the house. 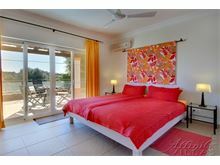 The third bedroom has twin beds and French windows open onto a south pool facing terrace and a Juliette balcony to the front of the villa. 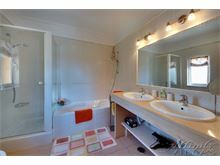 Both have an en suite shower room. Air conditioning and pool heating are available at extra cost if required. Maid service 5 times per week. This beautiful villa has made our family holiday just fabulous. The garden and pool are stunning and the villa itself is very cosy and provides a lovely home away from home. The location can't get any better either,although the villa is in a quiet area, so many stunning beaches are only a short drive away, and plenty of restaurants and supermarkets nearby too. We will definitely come back here. Fantastic villa in a great location! 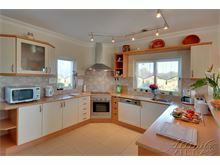 A lovely, light and spacious villa, with well equipped kitchen. Fabulous pool and very pretty gardens with areas for the children to explore and play. Villa was clean and well cared for and access to the washing machine for most of the day meant mum was happy too! 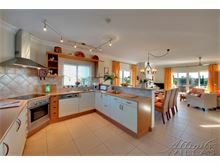 Villa is really close to some big supermarkets and also close to beaches and great restaurants. Excellent taxi services too. An easy 45 minute drive from the airport. Altogether a great spot, wonderful house and very relaxing holiday. Thanks! I wish you did villas all over Europe as Affinity is definitely one of the most efficient, friendly and good value companies I have used. Just home from our holiday to Casa Na Vinha and it was absolutely brilliant. It is my second time staying in an affinity villa and I will definitely be back. I would recommend hiring a car to go to nearby towns but if you choose not to you could have equal amounts of fun relaxing in the villa as it has everything you could possibly need. We made good use of the BBQ and kitchen during our weeks stay as well as getting all our washing done making unpacking much easier. We also spent a lot of time in the pool which was so much fun for all our family. We got the pool heated and it was always a perfect temperature whatever time we decided to go in. If you enjoy going out for dinner at night Carvoeiro is a short journey in a taxi where there is lots of nice restaurants and bars to visit, every meal we had was delicious and all the restaurants were so friendly and welcoming especially to our two young children. The pictures of the villa are 100% accurate if anything it's nicer in person! it's especially beautiful lit up at night. 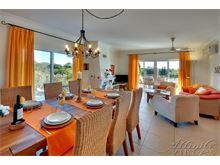 If you are thinking of booking this villa I fully recommend it, you will not be disappointed. First class service and excellent villa. A wonderful home - that we were delighted to enjoy. I would add that all local staff - maid, pool attendant etc were super polite and friendly. Fabulous villa! Lovely place ideal for family holiday. Would definitely go back. Thank you. Casa Na Vinha is a pretty, comfortable villa in a quiet and private location with all the facilities that one could wish for. Convenient for all local shops,towns and beaches by car and with a popular local restaurant within walking distance. Layout of villa and grounds extremely well designed so that there are several different areas of terrace, garden and lawn. The pool area is completely private. 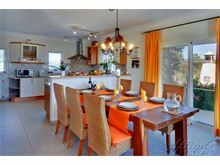 Suitable for families or groups a home where everyone can all find their own space. 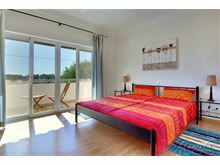 Both upstairs bedrooms have their own balconies front and back with pleasant views. The maid was lovely, came in 5 days a week and kept the house and terraces and pool area spotless. We particularly liked the bedrooms which were good sizes and the beds were probably the most comfortable we have ever come across and enjoyed in nearly 20 years of villa holidays. We thoroughly enjoyed our stay and would go back. Na Vihna is a true home from home and clearly loved and cherished by its owners. From the moment you arrive, it feels welcoming and the small details ensure an effortless and calm stay. An outstanding villa ensuring a memorable holiday all supported by fantastic customer service. 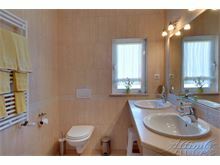 Na Vinha is a beautiful villa in a fantastic location. A short drive to local amenities and beaches. Also a short drive to the mountains. We highly recommend the villa if you enjoy a little seclusion.